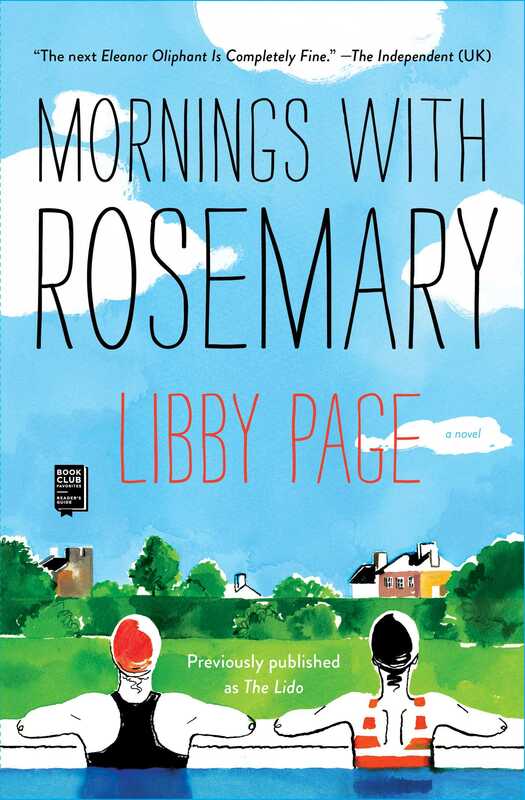 This reading group guide for The Lido includes an introduction, discussion questions, ideas for enhancing your book club, and a Q&A with author Libby Page. The suggested questions are intended to help your reading group find new and interesting angles and topics for your discussion. We hope that these ideas will enrich your conversation and increase your enjoyment of the book. Kate is a twenty-six-year-old who works for a local paper in Brixton, London, covering forgettable small stories. When she’s assigned to write about the closing of the local lido (an outdoor pool and recreation center), she meets Rosemary, an eighty-six-year-old widow who has swum at the lido daily since it opened when she was a child. The lido has been a cornerstone of nearly every part of Rosemary’s life. But when a local developer attempts to buy the lido and replace it with a posh new apartment complex, Rosemary’s fond memories and sense of community are under threat. As Kate dives deeper into the lido’s history she pieces together portraits of the pool and of a singular woman, Rosemary. What begins as a simple local interest story for Kate soon blossoms into a beautiful friendship that provides sustenance to both women as they galvanize the community to fight the lido’s closure. Meanwhile, Rosemary slowly begins to open up to Kate, transforming them both in ways they never knew possible. 1. Describe the opening of The Lido. How does it establish Brixton as a character? Do the interludes throughout the novel of life there help you to understand the community better? What do you think of Brixton? Is it somewhere you could see yourself living? 2. When Kate is first introduced to the reader, she is described as anxious, “living under a cloud. It follows her wherever she goes, and however hard she tries she can’t seem to outrun it” (2). What was your first impression of her? What do you think of the life she creates for herself in Brixton? Does she seem happy to you? Why or why not? 3. Describe your first impression of Rosemary? Do you like her? Rosemary is acutely aware of the results of aging, from the aches in her knees to the free bus card that she is now eligible to receive. Both are “a part of her life now that she resents. She still always pays for her bus ticket, on principle” (14). What does this detail tell you about Rosemary? In what other ways does she attempt to exert control over the aging process? 4. Rosemary agrees to allow Kate to interview her about the lido on the condition that Kate goes for a swim. What prompts Rosemary to require this? How does swimming in the lido expand Kate’s view of it? Would you have agreed to Rosemary’s request? 5. Describe Kate’s relationship with her sister. Is Erin a good older sister to Kate? Why or why not? Why do you think Kate is nervous about introducing Erin to Rosemary? What do the two women think of each other? 6. Rosemary and George are described as “a couple, like the quotation marks around a sentence” (73). Is this an apt description? How would you characterize Rosemary and George’s relationship? Do you think it was a solid one? Why or why not? How did they compliment each other? 7. The early articles that Kate writes for the Brixton Chronicle are “not stories that she would show the tutors who taught her journalism master’s classes” and the fact that her mother collects them in a scrapbook “makes it even worse” (9). Describe the Kate’s articles. Why is she ashamed of them? Why do you think her mother’s saving them compounds Kate’s feelings? Do you think she is a good journalist? Explain your answer. What skills does her job require? 8. When Kate was studying to be a journalist, she struggled to take the words of her classmates “as a comment on something she had created outside of herself, rather than a personal attack” (210). Is this still true of Kate? One of her colleagues tells her that she is too personally invested in her stories. Do you agree? How does this affect Kate’s stories? 9. When Kate thinks of Erin and her life “she feels left behind, as though Erin has run off into the distance and Kate is left frozen on the starting line terrified by the sound of the gun marking the start of the race” (55). Compare Kate’s view of Erin’s life with its reality. Are there any issues that Erin struggles with? What does Erin think of Kate? What causes the two to open up to each other? Were you surprised by any of their disclosures? 10. Rosemary tells Kate, “When you’re my age you’ll understand. . . . You begin to miss yourself” (62). What does Rosemary mean? What parts of herself does she miss most? 11. Why is Rosemary initially reluctant to reach out for help in saving the lido? What changes her mind? Describe the people who join or aid the protests to save the lido. Do any of them surprise you? Which ones and why? What reasons do the others have for helping? 12. While Kate doesn’t know Jay particularly well “his strawberry blond hair and kind face are part of the fabric of her days at the paper and somehow soothing” (119). How is Jay able to calm Kate? What role does he play in the protests? Why is the lido important to him? 13. When asked about why the lido is important to her, Rosemary “can’t begin to say everything so instead she says the start of the truth” (64). Discuss some of the reasons the lido is so important to Rosemary and to the community of Brixton. If Kate were asked the same question, what do you think her answer would be? Are there any places in your life that are as important to you as the lido is to Rosemary and Kate? Tell your book club about them. 14. What are some of the ways that the residents of Brixton attempt to save the lido? How do Kate’s and Jay’s professional roles influence their methods of protest? Were there any that you thought were particularly successful? Which ones and why? How would you have protested to save the lido if you were in Kate’s position? 1. If possible, go swimming with your book club. What was this like? Did you find it as refreshing as Rosemary does or as calming as Kate does? Why do you think being in the water helps both women? 2. When Rosemary and George begin living together, she asks him “how shall we organize the books? . . . Shall we have a shelf each?” (103). Do you organize your books in any special way? If so, tell your book club about your method. 3. The Lido has been optioned for a film. Who would you cast as Kate? As Rosemary? How would you structure the film? 4. The Lido has been compared to A Man Called Ove. Read both books with your book club and discuss them, comparing and contrasting the themes of each. In what ways were they similar? Do you think that Rosemary and Ove were alike? If so, how? Congratulations on the publication of The Lido! What was the most rewarding part of publishing your debut novel? Was there any aspect that surprised you? Thank you! I have dreamed of being an author since I was around six years old, so having that dream come true has been an amazing experience. I quit my job in marketing shortly after receiving my publishing deal, and I feel so lucky to now be able to spend all my time doing the thing that I love. I didn’t really know much about the publishing process when I wrote my book, so it has all been a huge learning experience for me. For Kate, “Seeing her own name . . . printed alongside her article in the Guardian feels surreal but thrilling” (214). Before becoming a novelist, you also worked as a journalist there. Can you tell us about the first time you saw your name in print? I actually first saw my name in print when I was very young. As a child I entered every writing competition I could find and subscribed to a magazine for young writers. I entered far more competitions that I won, but when I first saw a poem I had written in the magazine it really inspired me. It made me believe that if I loved writing as much as I did, and worked really hard at it, that maybe one day I might be able to do something as exciting as having my own book published. I feel so grateful for those early experiences that fueled my drive to write. Like you, Kate is both a swimmer and journalist. Is this where the similarities end? Are there any autobiographical elements in your story? I think most writers draw on their own experiences in some way to fuel their writing. Although Kate is very different to me in many ways, there are certainly aspects of my life that I used as inspiration for my writing. I moved to London from a small town (actually much smaller than Bristol, where Kate is from) so know what it feels like to arrive in a big city and struggle to find your feet. I think there is a perception that your early twenties are going to be the best years of your life, but I know for myself and many of my friends there were also lots of stressful elements in trying to find our way in the world. That was definitely something I wanted to explore in my book, and I hope that anyone who may have had a similar experience is able to relate and realize they are not alone. Can you tell us about your writing process? The Lido is intricately plotted, moving seamlessly between past and present and between Kate and Rosemary’s stories. Did you plot out the entire book before you began writing it? I spent about six months prior to writing The Lido planning the story. This didn’t mean plotting the entire book; instead I wanted to really flesh out the characters and the themes in the story before starting to write. That way it meant that the characters and the story were able to take themselves in their own direction to a certain extent. That said, I had the idea for the final line of my book very early on. I found that it helped to know the point that I was working towards. Your descriptions of life in Brixton from the lido to the market stalls are incredibly vivid and written with great affection. Did you base those descriptions on time spent at there? Do you still visit Brixton? Are there any other places in London that you love? I lived in Brixton for a while as a student, and really fell in love with the area. It felt to me a very distinct community but also a community that was under threat. By the time I started writing the book I had actually moved to North London, but I drew on my fond memories of Brixton and went back regularly for inspiration. I do still spend time there and it will always hold a very special place in my heart. But one of the things I love about London is that there are always new places to discover. I now live in North East London and have enjoyed getting to know that area—from the River Lea that I run alongside most mornings to local community groups that I have become involved with. Some other favorite places in London include Hampstead Heath and the swimming ponds there, the canals in Little Venice, and the beautiful view from the top of Primrose Hill. I feel very lucky to live in this city! Do you have any advice for aspiring writers? Anything that you wished you knew? My main advice would be to stick at it! I have wanted to be an author for as long as I can remember, but there were certainly times when I doubted I could actually make it happen. It took me a year to find a literary agent, and I was close to giving up when I found my now agent. I am so glad that I persevered. As writing is (usually!) a solo activity it can at times be quite isolating, so I would definitely recommend keeping friends and family close—I feel so grateful to have the support of my loved ones when I’m finding the writing tough, or just want someone to talk to about an idea. Also, don’t be afraid to step away from your writing if you’ve hit a block—I find some of my best ideas come when I am out for a walk or a swim and my mind has a bit more space to wander. Similarly, do you have an advice to aspiring swimmers? Swimming in the lido brings a sense of peace to Rosemary and Kate. What would you like to tell your readers who are reluctant to take the plunge? I actually only really learned how to swim a few years ago, so I would say it is never too late to discover a love of swimming! I learned to swim as a child but was never very confident in the water. A few years ago my sister, who is a strong swimmer, gave me some lessons and with a lot of practice I learned to improve my stroke and my confidence. Don’t be put off if you have to start small—I started being only able to manage a length or two at a time. For me swimming outdoors is more about the experience of being in the water than it is about swimming, so even a quick dip can feel really rewarding. Both Kate’s and Rosemary’s first experiences swimming were particularly memorable to them. What was yours like? Did you swim in a local lido? If so, can you tell us about it? As a young child we had a tiny local outdoor pool that we went to with my school. I don’t remember much about it other than it always feeling very cold! 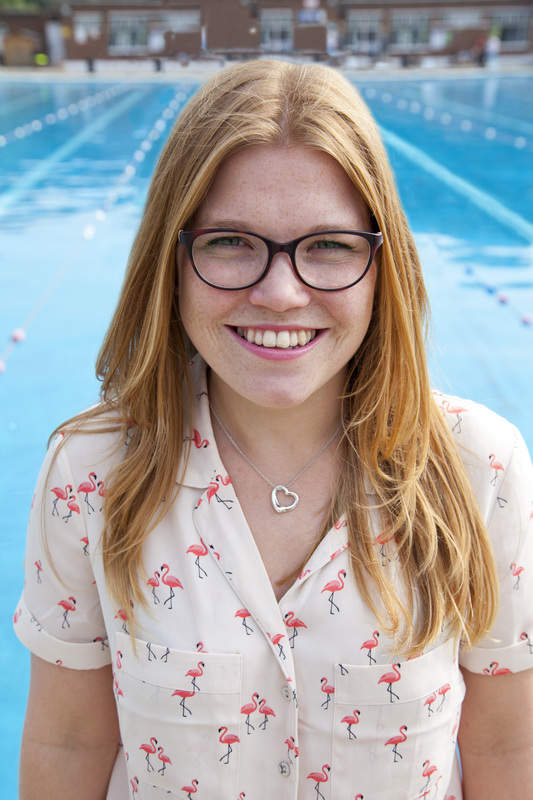 Throughout my childhood I enjoyed splashing in pools on holiday with my family, but it’s only as an adult that I’ve become a confident swimmer and really taken to the water. What do you hope that readers take away from The Lido? I hope that reading The Lido might make readers consider the value of places in their own community, whether it’s a local library, bookshop, or swimming pool. It’s easy to take these for granted, but I think our towns and cities would be so much sadder if such places no longer existed. They represent values of community and friendship that I believe are important to all of us as humans and are worth fighting for. I have been working on a second novel—the theme of which is still to be revealed! It is a standalone book, so not related to The Lido, but I hope that readers of The Lido will enjoy it too. Watch this space!